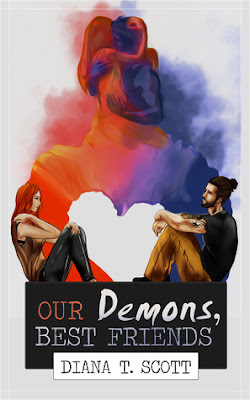 Diana T. Scott, an American author, pens a heart-wrenching contemporary love story about two medical interns in her new book, Our Demons, Best Friends which is the first book in the Half of Me series, that unfolds a deeply moving blossoming love story between Ava and Sebastian, two broken souls beholding lots of pain and broken promises from their not so distant past, by highlighting how these two souls collide and how they unite under one cause. Ava and Sebastian are two medical residents who in a perfect world, would really like each other. But both of them are closely watched by their demons. Their baggage is not light - Ava has hers carefully folded in vacuum bags to occupy as little room as possible; Sebastian wears his like a lead armor that makes him slouch sometimes. They like each other, but how are their demons going to get along? Ava, a first year medical intern, and from the first meeting itself, she develops a fondness towards Sebastian, a senior medical intern in her hospital. Sebastian is a hot, brooding introvert who does not like to smile that often or even socialize too much. But just like every other girl, she too developed a crush on Sebastian. But soon Ava's friendly gestures towards Sebastian brings him close to her and eventually they become really good friends to even deeper than that. Here both Ava and Sebastian fight their battles with loss every day. So how can their pain collide and fall for one another? For that you need to read the book!! The writing quality of the author is exquisite and something that is easy to comprehend with. The narrative style is simple and free-flowing and at times inspired by humor. The story line not only features a love story but also friendship among the interns who joined along with Ava in that hospital. The story is so addictive that it kept me glued till the very end. And not mention how the author have poured all her emotions into this story while writing it, hence it feels like something that came straight out of the heart. The love story blossoms in a medium pace, there is no rush to it. The characters are the best part of this book which are all developed with lots of realism in their demeanor. Ava is sweet, independent and at times a funny and charming girl who loves to read a lot, but she also has a dark and broken side which she keeps hidden inside herself. Sebastian, on the other hand, is a not so friendly guy, does not hang out with his fellow interns or does not smile too often, he likes to be alone as his pain is very evident from his demeanor. Rest of the characters like Emily, Miles, Collin etc are too very well-developed and the bond of friendship depicted between all these characters is something very precious. How they non-stop support one another, throw surprise party, hang out, cherish good and worst times are all projected with fun and love. Now let's come to the gem part of this book, which makes it stand out among the rest- love. Well, in short, if I've to describe then I'd say, that the love made me feel very deeply, not only for the love between Ava and Sebastian, but also for Ava and Sebastian individually. The back stories of both Ava and Sebastian are painted with lots of layers of emotions which has enough sadness, happiness and even shock. Both these characters are explained with so much depth that got under my skin and in the end it became bit difficult for me to let them go. Their love made me shed tears of joy, pain and at times funny sarcastic happiness. And with a climax like that, makes the story even more poignant. So I'd like to request all the contemporary readers to read this book for sure as it not only syncs perfectly with the right emotions but also jingles perfectly with an equally awesome playlist. Verdict: Definitely a must read! This book holds no power to disappoint any kind of reader. Courtesy: Thanks to the author, Diana T. Scott, for providing me with a copy of her book, in return for an honest review.